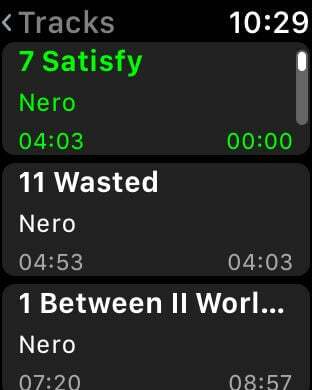 wAudio is a stand-alone audio player for your Apple Watch. 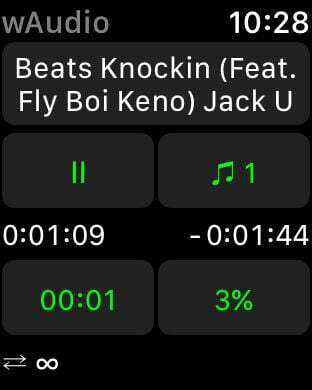 First, use the iPhone app to sync audio to your Apple Watch. Next, pair a bluetooth device to your Apple Watch using Settings - Bluetooth. You can select an already paired device to AirPlay to by swiping up from an Apple Watch face. 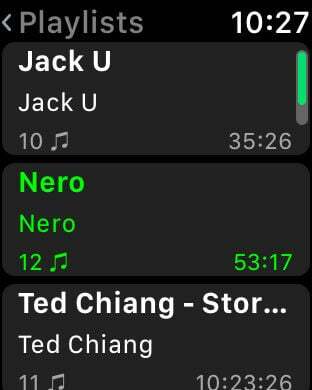 Then, you can use wAudio to AirPlay audio directly from your Apple Watch to your bluetooth device (without your iPhone). Sync audio on your iPhone that has been synced through iTunes. Sync audio from the wAudio iCloud Driver folder. Sync podcasts that have been downloaded using the Apple Podcast app. Choose the audio quality to export from your iTunes Library. Select a specific track to play. Skip by time or percentage. Gestures for skipping tracks and seeking within a track. Bookmarks to resume playback of audiobooks. Each playlist, audiobook, podcast has its own custom settings and bookmarks. Change playback rate from 0.5x to 2.0x. Swipe right/left to additive skip tracks forward/backward (e.g. 2 swipes to the right will skip 2 tracks). Swipe up/down to additive seek within a track (e.g. skip 30,60,120,... seconds forward/backward). Settings - customize each playlist. Bookmarks - manually add a bookmark, or select to a bookmark to resume. Audiobooks - bookmarks on with auto resume. 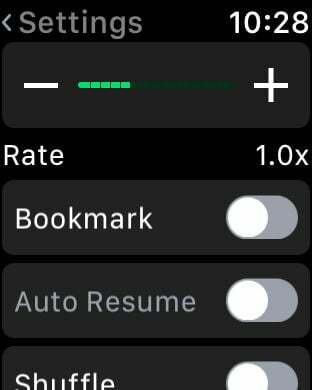 (optionally) change the playback rate. use swipe down gesture to repeat something you missed. Music playlists - shuffle on with one touch repeat. swipe left once to restart a track or right to skip to the next track. or use the track listing to jump to a specific song. DJ Mixes - manually add a bookmark to return to a specific song within the mix. use time or percentage seek to jump to a particular set without having to listen from the beginning. Podcasts - swipe up to skip past an advertisement. 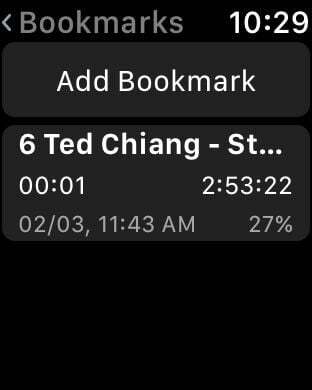 I wrote wAudio because I needed a better experience for listening to audiobooks on my Apple Watch. Personally, I use wAudio at the gym, in my car, at work, or out for a walk. I generally finish one audiobook a week, so expect bug fixes & updates. Please leave reviews with information about bugs and/or feature requests. NOTE DRM protected audio files are not supported. NOTE the iPhone app has to temporarily export audio files from iTunes to transfer to Apple Watch to temporary file cache. Those temporary files are deleted to free up space on the iPhone as they are transferred to the Apple Watch. NOTE wAudio does not access HealthKit data. It only needs permission to play audio in the background.